HOW DO I KNOW IF A BOXER PUPPY IS RIGHT FOR ME AND MY FAMILY? 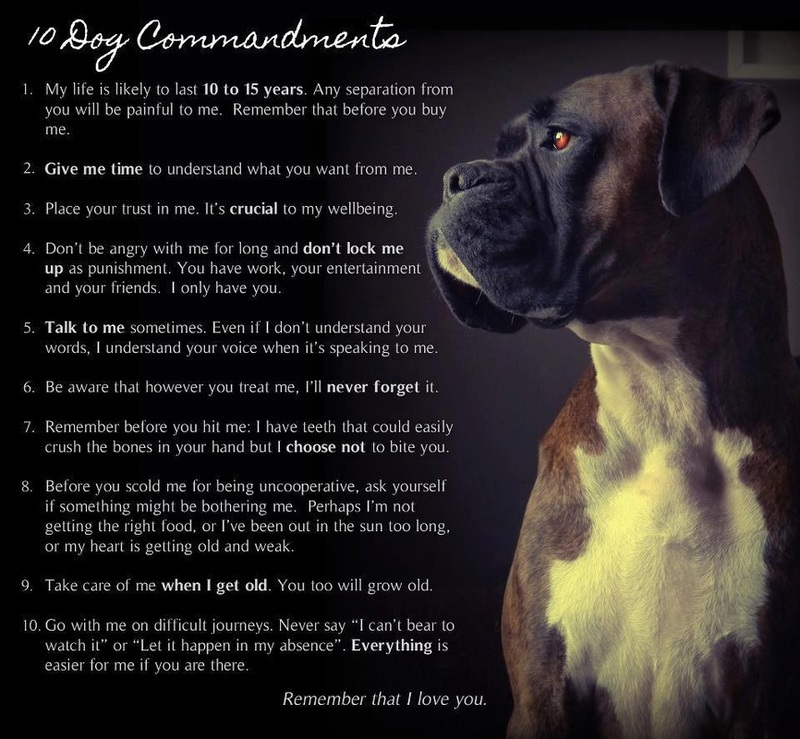 Will you take full responsibility for your BOXER and all its needs for the next 10-15 years? This is NOT a task that can be left to children. Will you invest the time, money and patience it takes to socialize & train the boxer to be a good companion? This does not happen by itself! A happy dog is a trained dog! A happy dog owner has an obedient dog! Boxers are members of the Working Dog Group for a reason. They LOVE to be trained and they LOVE to have a job. Can you give your dog a job that will be fulfilling for both you and the dog? Do you really want to live with a 50-75-pound or more size dog that goobs, sheds and has a high activity level? Will you continue to accept responsibility for the dog despite life changes such as new babies, kids going off to school, moving, divorce, or change in work schedule? Are you ready to deal with a puppy, which by 6 months old, will be large enough to do significant damage to your home and personal belongings if not supervised? Are you financially able to spend the money it takes to provide proper veterinarian care including vaccines, heartworm testing & preventative, spaying or neutering, annual check ups, and deal with any health problems that can occur with this breed? Are you going to ensure that your boxer gets enough attention and exercise? (Boxer puppies need several hours of both every day)! Are you prepared to deal with the cost and aftercare of an ear crop if you have a show puppy or one whose ears will be cropped? This can take many months of diligent taping. Even boxers who have natural ears often need taping to get them not to look like The Flying Nun! If you answered yes to ALL of the above, you are ready to start contacting breeders. Start early because most responsible breeders have a waiting list and only breed on occasion. Remember, the right puppy or adult is worth the wait! Boxers can accidentally knock down someone who is not steady on their feet; can aggravate your back or shoulders when leashed, unless they are properly trained! They have the strength and agility, and can cause unintended harm unless properly trained. Sometimes an older, already trained, boxer is recommended. Rescue is a great place to find an older boxer and give a dog a new chance at life. Children can easily be knocked down by an excited puppy or adult. Boxers who have been raised & trained properly, are usually very gentle with children by nature, but you MUSTsupervise them when they are together so that neither the child nor the dog is injured. Children often use hitting or spanking to control a puppy, and this can traumatize the dog and make him/her fearful. I don’t sell boxers to families with children under six years of age for these reasons. No exceptions. People who travel a lot or work long hours should never buy a boxer. They are very dependent and social. They need to be with their families and can become destructive and develop behavioral problems such as separation anxiety, excessive chewing, excessive barking, etc. if left for long periods of time unattended. People who are not willing to put in the time and work to train and socialize their dog properly! The boxer is a family protector by nature and if left untrained and unsocialized could be a problem for some people. Obedience training with positive reinforcement techniques is mandatory, and it starts the day you bring your puppy home. MOST BREEDERS SPEND YEARS PLANNING A LITTER, INORDINATE AMOUNTS OF MONEY TO CONCEIVE, WHELP AND RAISE A LITTER, AND DEDICATE TWO MONTHS OF THEIR LIVES IN THE NURSERY TO SOCIALIZE AND WORK WITH THEIR PUPPIES TO GIVE THEM THE BEST START POSSIBLE. THEN, IT IS UP TO YOU TO CONTINUE TO PUT IN THE EFFORT SO THAT YOU HAVE THE BEST POSSIBLE LIFE WITH YOUR BOXER!